If we look at major indices of 3 years back, Investors have not made money from stock markets. Major indices like Sensex and Nifty have moved only a little. On 1st Dec 2010, Sensex was at 19,850 and closed at 21,193 on 27th Dec'13 giving marginal positive returns of 6.7% during last 3 years. Small Cap Index and Mid Cap Index have given negative returns during the same period. Moreover, big daddies of dalal street, companies like Reliance, SBI and L & T have given negative returns in the range of -5% to -30% to investors who invested in them during Dec'10. We always suggest salaried employees as well as businessmen / entrepreneurs to invest via SIP (Systematic Investment Plan) route. Simply get some savings from your monthly income and Invest in equities for long term. SIP not only allows you to save every month in a disciplined way but also help you ride through ups and downs of stock market. Lets review how SIP approach have benefited our Hidden Gems members during last 3 years. Below is the table which illustrates value of Rs. 10,000 invested (every month) in Hidden Gems (Unexplored Multibagger Small Cap Stocks) vis a vis value of Rs. 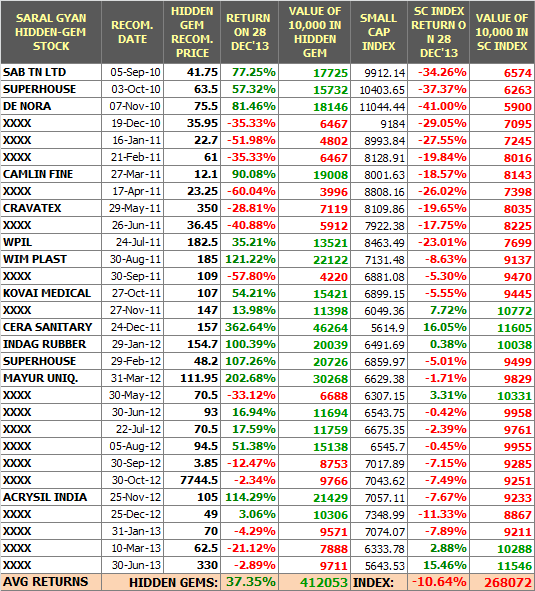 10,000 invested in BSE Small Cap Index during last 3 years. We are delighted to share that average returns of Saral Gyan Hidden Gems (30 stocks) during last 3 years is 37.4% compared to -10.6% of BSE Small Cap Index. Investment of Rs. 10,000 in Hidden Gems during last 3 years not only allowed you to save Rs. 3 lakh but also appreciated your investment giving overall profit of Rs. 1.12 lakh, making your total Hidden Gems stocks portfolio of Rs. 4.12 lakh. However, if you invested the same amount in Small Cap Index, you would be sitting with an average loss of Rs. 31,928. In fact, actual returns of Hidden Gems are much higher as we suggested partial / full profit booking at higher levels in many of our Hidden Gems and exit in few of non performing companies. It gives us immense pleasure to inform you that 11 Hidden Gems out of 30 during last 3 years have given more than 100% returns to our members. We are hopeful that we will continue to hunt best Hidden Gems from universe of small caps by doing authentic, in-depth and unbiased research work and support our members to make educated investment decision. Subscribe to Hidden Gems and start investing systematically. Avail attractive Discounts, Freebies and New Year Surprise Gift under our ongoing Merry Christmas & Happy New Year 2014 offer. To know more about Merry Christmas & Happy New Year 2014 offer, click here. Hurry, offer closes on 31st Dec'13 at 11.59 pm.